The new range is Platypus Australia’s most comprehensive and innovative collection to date, boasting exclusive prints, colour blocking and neon accents in the latest silhouettes. For the growing Baby Range, the introduction of new Long Sleeved All in Ones reflects the demand for increased sun protection combining coolness and comfort. The new Baby Sunsuitsalso features an improved closure mechanism in the crutch, the original Velcro replaced by snaps. For Girls Swim, Platypus continues to deliver age appropriate translations of current trends in women’s swimwear. The Leotard with long sleeves is the newest re-incarnation of the long sleeved one piece. The popular high neck silhouette is extended in the new High Neck Tankini, alongside the continuation of athletic and performance styles. TheGirls Swimrange also incorporates on-trend fashion detailing including fringing, pompoms and multi-strap styles enhancing the back views. 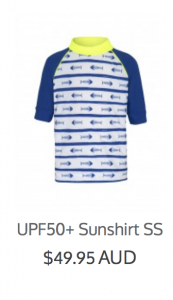 In Boys Swim, Platypus has redesigned its staple Boardshortto feature a more tailored shape and fit. To accommodate the new tailored fit, the flat front Boardshorts have been made in a 4 way stretch fabric that works to deliver a greater level of comfort. Platypus Australia continues to promote environmental sustainability in fashion, with its printed Swim Shortsmade from 58% Recycled Plastic Bottles.